I was incredibly excited to hear about this book being released. I've loved Lydia's previous books because she writes my sort of historical fiction. Her books are always well researched with a brilliant attention to detail without being dry and detracting from the story. Liberty's Fire is no exception. 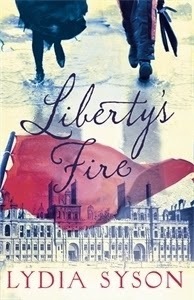 Liberty's Fire is the story of the Paris Commune. Previous to reading this book I knew nothing about this part of European history despite having a degree in Modern European History and I was utterly fascinated to find out about it. I enjoyed this book for several reasons. I loved the two main characters Zephyrine and Anatole and seeing their relationship blossom over the course of the book. I was rooting for them for the first page. I also loved the secondary characters especially Jules as he was a really intriguing character. I also loved finding out more about the Paris Commune. It is such an interesting part of history and I am so pleased I found out more about it. My inner history geek now wants to know more. All in all a fascinating read which I thoroughly enjoyed because of the historical detail and awesome story.